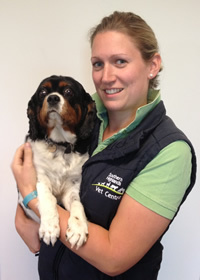 Catherine has worked at the practice since 2003. She completed her Certificate IV in Veterinary Nursing in 2007, and then went on to complete her Diploma in Veterinary Practice Management in 2010. Even though Catherine spends most her time on reception, she still loves working the animals. In her spare time she enjoys gardening, playing soccer, tennis and camping. She has 2 farm dogs Jill the Kelpie and Bob the Border Collie.